SOMERVILLE -- Senior Lauren Fedore (East Lansing, MI) and sophomore Cara Cadigan (Nahant, MA) each netted a goal and added an assist to lead Tufts University to a 4-1 win over Bowdoin in a New England Small College Athletic Conference women's soccer match at Kraft Field on Homecoming Day for the Jumbos. Fedore headed a free kick attempt from fellow senior Jessie Wagner (Sudbury, MA) past senior goalkeeper Kat Popoff (Taipei, Taiwan) in the 13th minute of action. Cadigan put the Jumbos (8-1/5-0 NESCAC) up 2-0 in the 27th minute of play. She collected the ball at midfield and proceeded to dribble past a pair of Polar Bear (6-3/3-3 NESCAC) defenders and blast a shot past Popoff. 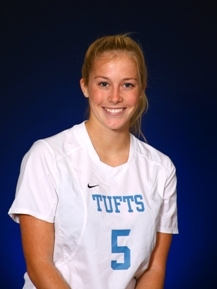 Tufts jumped out to a 3-0 lead in the 59th minute, as senior co-captain Martha Furtek (East Falmouth, MA) received a pass from Fedore and beat three defenders before blasting a shot from 25 yards out. Bowdoin collected its only goal when a Jumbo defender headed the ball into the back of the net off a free kick. Freshman Geneva DeGregorio (Whately, MA) added the final marker of the contest, as she collected a crossing pass from Cadigan, took one touch and put the ball in the back of the net for Tufts' fourth goal. Jumbo sophomore Kate Minnehan (Hopkinton, MA) faced two shots on goal, stopping both, while Popoff stopped one shot on the afternoon. The victory is the seventh straight for the Jumbos. The school record is 10 in 2005. Tufts returns to action on Wednesday, October 9, as the Jumbos travel to Middletown, Conn. for a NESCAC contest against Wesleyan with kick-off set for 4:00 pm. Bowdoin returns home for a NESCAC affair on Saturday, October 13, as the Polar Bears take on Connecticut College at 11:00 am.